The village of Saint Jean de Minervois lends its name to a mountain appellation in the remote reaches of Minervois devoted to the production of fortified Muscat. The elevation reaches 660 feet above sea level, and the landscape is arid, windswept, and so rocky that only vines could productively be cultivated (and even that is arguable!). This appellation is deep in the garrigue and today supports less than 200 hectares (494 acres) of vines which in turn support five independent producers and one cooperative (which dominates the production). 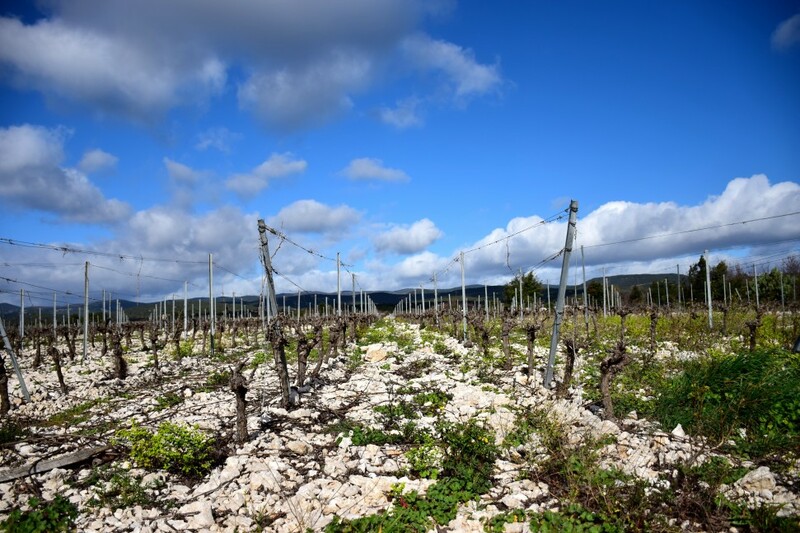 It is the Spartan soil and the dense limestone, coupled with the rigorous high altitude weather patterns, that give Muscat de Saint Jean de Minervois its reputation for elegance, length, and finesse. Not incidentally, these conditions also give the wine an ability to evolve in bottle in a much more interestingly way than is afforded its coastal brethren (the Muscat AOCs of Frontignan, Lunel, and Mireval). Saint Jean is the finest appellation for this wine in Languedoc, and rivaled in France only by Muscat Beaumes-de-Venise in the Rhône Valley for delicate, high-altitude renditions of fortified Muscat. Arguably, Saint Jean makes the most delicate fortified Muscats, because its soil is much stonier and more calcareous than Beaumes-de-Venise, whose soils have more clay. Michel Poudou settled down here to make wine under his own label. He comes from a long line of growers that has farmed grapes in Minervois since at least the 17th century (his brothers continue the family domain). Most of his professional life was spent elsewhere managing wineries for others, be it in America, Argentina, China, northern Africa, Spain or France. He’s a vivacious, intelligent, and hard-working man—that’s Michel in the photo below amid his vines in the striped sweater, watching Pascal Frissant give Oregon’s Mark Vlossak a pruning lesson. The domain has three parcels totaling 6.5 hectares, or 16 acres, dedicated to the old, noble Muscat variety known as Muscat Blanc à Petits Grains. Each parcel is isolated and has been farmed organically since the 1980s. Of the five domains in the AOC, Montahuc is one of two that farms organically (and the second one is so small that its wines are not exported). The wine is made by stopping the primary fermentation with the addition of neutral alcohol at the halfway mark, thereby capturing primary fruit aromas and flavors. This method was perfected in the 13th century by a Catalan alchemist in Montpellier and became widely used in Roussillon, which made itself the center of vin doux naturel production back in the day. Some four hundred years later the method was adopted in the Douro Valley for the production of Port. Saint Jean de Minervois is required by appellation rules to have a minimum of 15 degrees of alcohol and 125 grams of residual sugar. 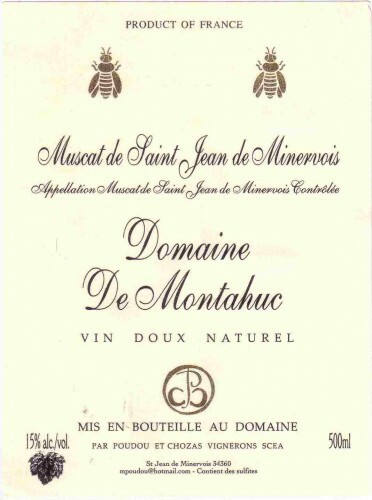 Domaine de Montahuc aims to have exactly those minimums, and no more, in its wine every year to reinforce the natural elegance given it by the mountain terroir. 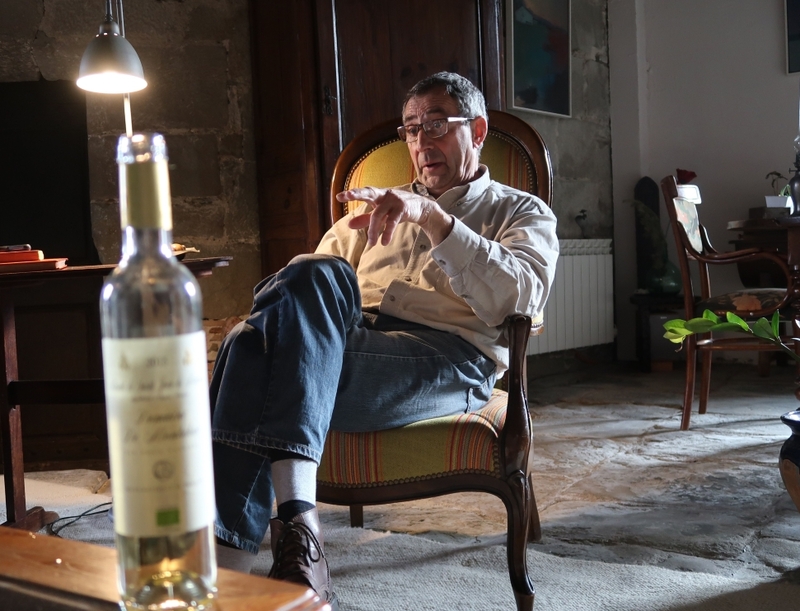 Michel makes two wines: a young vine fortified Muscat that he sells only locally; and his classic Muscat de Saint Jean de Minervois made from vines between twenty-five and thirty-five years old. 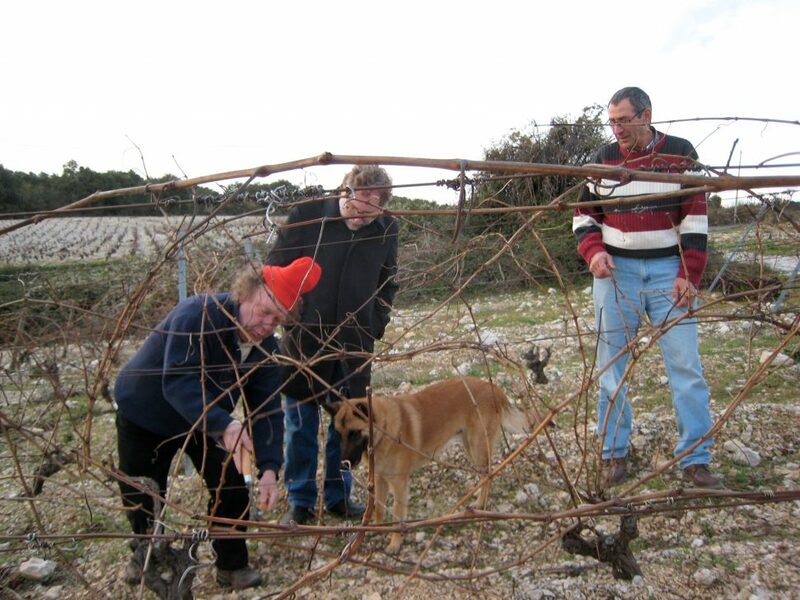 He harvests by hand, uses no cultivated yeasts or enzymes to make the wine, and he buys his alcohol from a small producer outside of Perpignan. His annual production ranges from some 1,600 to 2,100 cases of 12/500ml bottles. In the old days, fortified Muscat was a preeminent aperitif wine. One can still find members of France’s older generation who favor it as such. These days, it’s much more readily served as a dessert wine, and it excels with fresh fruit, fruit tarts, and cream-based desserts. Muscat Blanc à Petits Grains Organically farmed, hand-harvested grapes from extremely rocky, limestone terroir. This wine is intensely aromatic, full-bodied yet radiating finesse, and it excels with fresh fruit, fruit tarts, and cream-based desserts. 1,600-2,100 cases annually.